You get two Service Dog ID cards with your order, one for your dog and one for you to carry in your wallet so you can easily show others what the law says. Choose from Service Dog, PTSD, Seizure Alert Dog, Service Dog In Training, Medical Alert, Search and Rescue Dog, Service Animal, Guide Dog, Hearing Assistance, Working Dog, Mobility Dog on your tags. These cards make it easy to educate the uninformed of your rights. 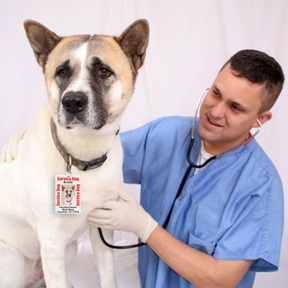 Your Service Dog ID Tags clearly identify your companion as a Service Dog. ordering was simple, shipment fast and cost was low. would definitely purchase from this site again. Love the tags. Looks more official for my dog to get into events. Click the button below to add the No-Picture Service Dog Tag Set for Large Dogs (2 Lrg Tags) to your wish list.